I'm a pet too. What we are asking for italian rabbits. 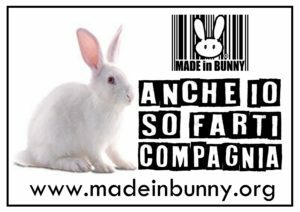 - Made in Bunny O.d.V. Addressees of the petition: To the Government of the Italian Republic, to the Minister of Health Giulia Grillo, to the Regional Health Assessments and to the Presidents of the Autonomous Provinces of Trento and Bolzano, to the European Parliament. 13. The rabbit is recognized as a pet (NOT DPA). a) The keepers, for whatever reason, have the obligation to provide for their psychophysical wellbeing by respecting the rules of hygiene, proper care and nutrition, taking into account the animal’s own ethological characteristics. b) A national registry of the rabbit is established, in which the subcutaneous microchip number and the personal data of the owner will be inserted. c) It is forbidden for anyone to abandon rabbits that have acquired domestic habits and / or born in captivity. d) It is forbidden for anyone to mistreat rabbits who live in freedom and in parks. The administration of food not suitable for the species is also considered maltreatment. e) Rabbits living in freedom are sterilized by the territory’s competent health authority and re-integrated into their group. f) Protectionist institutions and associations may, in agreement with local health units, manage colonies of rabbits living in freedom, providing health care and survival conditions. g) Euthanasia is only intended for serious and incurable cases of disease. h) In the case of imprisonment for commercial purposes (livestock, shops, fairs and similar), the holder must provide the purchaser with documentation proving the inclusion of the microchip and the regularity of health checks and vaccinations. Animals must not be directly exposed to the public or placed in display cases or display cases, but must have the opportunity to take shelter in adequate shelter and have sufficient space to perform the normal activities of the species. It will be the duty of the Municipal Authority, assisted by the police and the competent health authority for the territory, to enforce this obligation. 1. The regions regulate with their own law, within six months from the date of entry into force of this law, the establishment of the canine and burial register in the municipalities or local health units, as well as the procedures for enrollment in this registry for the issue to the owner or holder of the identification code of the dog and the rabbit, to be inoculated by subcutaneous microchip. 2. The municipal services and the veterinary services of the local health units shall comply, in the treatment of animals, with the provisions referred to in Article 2. The Mayor is the highest authority in the municipal territory responsible for the protection of animal welfare, for which maintenance, sterilization, microchipping and for urgent care in case of diseases and / or accidents of stray animals on its territory, are chargeable to the Municipality. The Municipalities, together with the Protectionist Associations, will have to encourage adoptions and train citizens through programs aimed at teaching the correct management of animals and disincentivating abandonment. 1. Anyone who abandons dogs, cats, rabbits or any other animal kept in his own home, is punished with the administrative sanction of the payment of a sum between five hundred and two thousand euros. 2. Anyone who fails to register their dog at the registry office referred to in paragraph 1 of Article 3 and their rabbit at the registry office referred to in paragraph 13 b) of Article 2 shall be punished with the administrative sanction of the payment of a of five hundred euros. If the animal for which the insertion of the microchip has been omitted is for sale, the sanction is doubled. 3. Anyone, having registered the dog at the registry office referred to in paragraph 1 of article 3 or the rabbit at the registry office referred to in paragraph 13 b) of article 2, omitting to insert the microchip, shall be punished with the fine administrative payment of a sum of euro three hundred. 4. Whoever trades dogs, cats and rabbits for the purpose of experimentation, in violation of the laws in force, is punished with the administrative sanction of the payment of a sum between five thousand euros and ten thousand euros.